Gov. 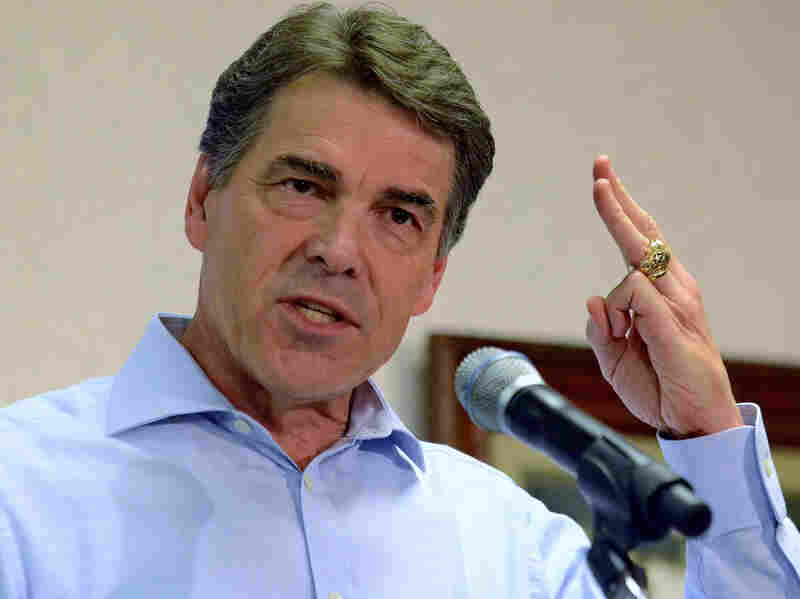 Perry Hopes To Turn Medical Liability Record Into Votes : Shots - Health News Texas Gov. and presidential candidate Rick Perry is passionate on one point about health care. Fixing the nation's health care system must include a major reform of the medical malpractice system. Republican presidential candidate Texas Gov. Rick Perry speaks to supporters in Greenville, S.C. on Aug. 20. Just a few weeks into his campaign, Texas Gov. and presidential candidate Rick Perry isn't talking a whole lot about health care, except to criticize President Obama for last year's law. And he's not considered a health care expert. But he's is passionate on one point: Fixing the nation's health care system must include a major reform of the medical malpractice system. In 2009, Perry and fellow GOP presidential competitor Newt Gingrich wrote in a Washington Post op-ed that Texas has successfully controlled health care costs, and at the same time has improved quality by enacting tort reforms in 2003. "Fewer frivolous lawsuits have attracted record numbers of doctors to the state as medical malpractice insurance premiums dropped by half," they wrote. They also mention Christus Health, a large Catholic nonprofit system with a significant presence in Texas, which reduced its liability defense payments from about $100 million in 2003 to $2.3 million last year. The savings went to expanding health-care services in low-income communities. The 2003 law Perry enacted capped non-economic damages — court awards for pain and suffering – at $250,000 per defendant. There is no cap on economic damages, such as medical expenses. Republicans and physicians have long argued that massive court awards make it difficult for doctors to obtain malpractice insurance coverage at affordable prices – or at all — and that they increase health care costs by prompting them to practice defensive medicine. Consumer advocates and trial lawyers, though, have countered that capping awards infringes on the rights of individuals to be properly compensated, that the caps don't do much good in holding down costs. Perry wrote in an op-ed in the Washington Examiner in 2009: "In 2003, I declared the medical liability crisis an emergency item, and the legislature responded, passing sweeping reforms that protected the patient .... We ended the practice of allowing baseless, but expensive, lawsuits to drag on indefinitely, requiring plaintiffs to provide expert witness reports to support their claims within four months of filing suit or drop the case." But Jon Greenberg of New Hampshire Public Radio today debunked some of Perry's claims on tort reform on the Politifact website: "The wholesale transformation that Perry describes is not backed up by the numbers. Perry said Texas has 21,000 more doctors thanks to tort reform. That's flat out wrong. Texas has only about 13,000 more doctors in the state and the historic trends suggest that population growth was the driving factor. We rate his statement False." What else might "Perrycare" have to offer Americans? "Rick Perry believes the best way for the federal government to improve health care is to stimulate job creation so more Americans are covered by employer-sponsored health plans," according to his campaign website. "Creating jobs will also reduce the strain on public safety net programs like Medicaid, saving taxpayer dollars."